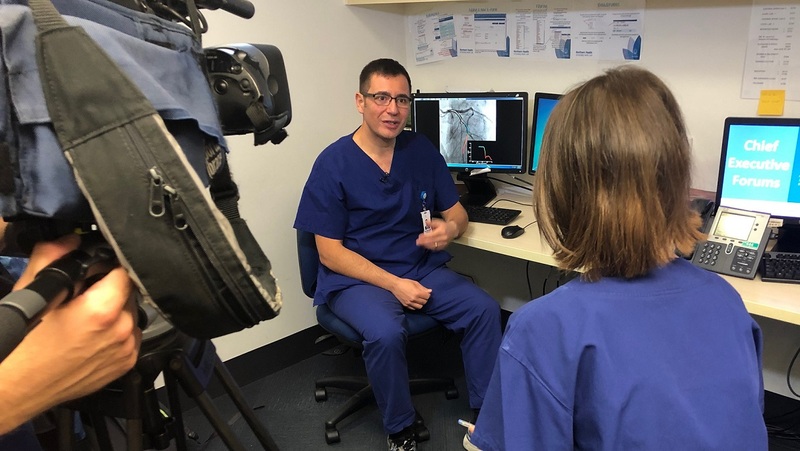 We welcomed Channel Nine to Northern Hospital Epping to interview Cardiologist and University of Melbourne Professor, Peter Barlis, about a cutting-edge technology used to create virtual scans of inside coronary arteries. In collaboration with Melbourne University, the world-first virtual reality technology has been designed to give cardiologists greater information and help to improve clinical decision-making for better patient care. Pioneered by Professor Barlis, the technology uses the latest in high-resolution scans and the use of super-computers and mathematical models to compute a “virtual fly through” inside the artery, to look at how cholesterol deposits form and to guide cardiologists on whether treatment with a stent is required. Not only will the technology be beneficial for clinicians, it will also provide numerous benefits for patients including minimising the number of invasive procedures and allowing for faster, more accurate assessment. “Future developments of the technology will see scan results available almost instantaneously at the point-of-care, thereby giving doctors the best and quickest way to safely manage each patient with cardiovascular disease,” said Professor Barlis. Northern Health patient, 68 year old Frank Davies, has suffered heart complications for over 20 years. Yesterday, he spoke with Channel Nine reporters about his journey and his hopes for the new technology. “If it saves one person, it’s worth it,” Frank said. The technology has been patented by Professor Barlis and his team, who are working to bring this to as many patients across Australia and the world, and has been published in the prestigious European Heart Journal.